Welcome to our September 2018 newsletter. Leading Australian environmental thinker and permaculture co-originator, David Holmgren, will present his highly engaging multi-media talk ‘Aussie Street’, a speculative eco-narrative, seen through the microcosm of four adjacent houses.‘Aussie Street’ presents a realistic and light-hearted portrait of our shared suburban history, outlining a gutsy, and essentially hopeful, scenario of our shared future. It provides inspiration and ideas for anyone wanting to create a fulfilling and sustainable life. ‘Aussie Street is my way of illustrating both the changes that have occurred in suburbia over many decades, and the potential for positive, realistic changes into the future,’ Holmgren says. 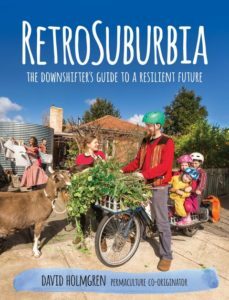 Holmgren is the author of RetroSuburbia; the downshifter’s guide to a resilient future, which shows how Australians can downshift and retrofit their homes, gardens, communities and themselves to be more self-organised, sustainable and resilient. Holmgren will also participate in a panel discussion and Q&A with local thought leaders and sustainability advocates. Local community and environment groups will hold an information display, with supper and drinks available for sale from 6.00pm. This special event is hosted by Mount Alexander Shire Council as part of its Sustainable Living Workshop series, in partnership with Mount Alexander Sustainability Group (MASG) and supported by Localising Leanganook. 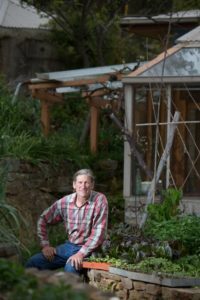 “David is a leading ecological thinker, writer, teacher and we are looking forward to hearing his thought provoking ideas, as well as the panel discussion amongst our local sustainability leaders about how we can move forward locally,” said Mary Blain, Deputy Chair, MASG. A one day workshop with Michel Bauwens, Peer to Peer and Commons Transition advocate, for activists, community leaders and local government representatives. 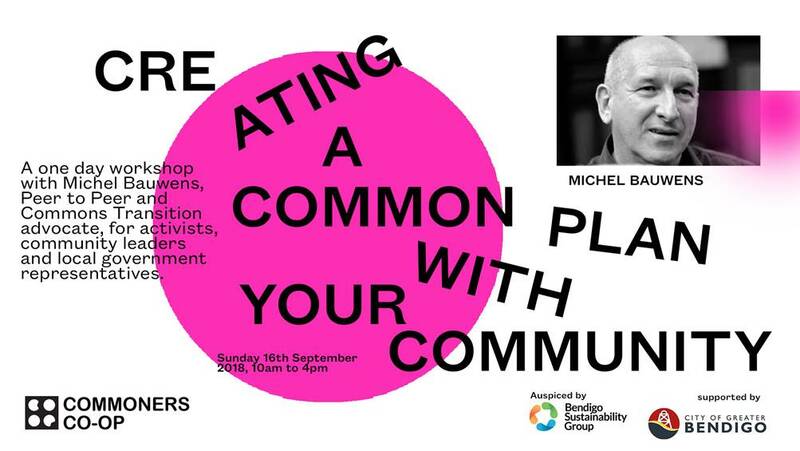 Michel will provide an overview of the Commons Movement and worldwide initiatives currently transforming the social, economic, political and technological landscape. The workshop will be held in Bendigo but is open to anyone active and/or interested in ‘the Commons’, new governance, sharing/solidarity/new economies, peer to peer programs, food and housing security, organic/regenerative farming, sharing platforms, ethical business, sustainability, renewable energy, earth law, worker owned co-operatives, block chain, crypto currency and sharing cities in a post capitalist future. This event is presented by Commoners Coop, auspiced by Bendigo Sustainability Group and supported by City Of Greater Bendigo. 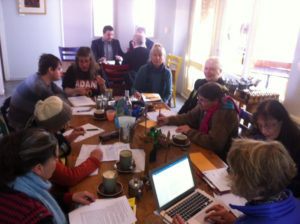 Join other concerned locals for a cuppa and chat while writing a letter to your MP and other members of the Labor party. Three letter-writing-cafes have been held in August. If judged on effort, facts, creativity and passion, these letters sent by members and associates of the Central Vic Climate Action Group have been of the highest standard, imploring our MP’s to take climate change seriously and rule out the proposed Adani mine. The coffee is good and the cause is just. Come along for an hour or so and bring a friend or neighbour too. Plans to start a cafe in Daylesford are well underway with the first expected in mid to late October, on Sunday afternoon . Watch this space for start date, time and venue. If you’re interested in contributing to the organising group or offering your skills as a fixer or supporter contact Danny Kinnear on mobile 0488 604 231. The organising group will meet next Thursday September 6th, 1.30pm at Victoria Park. Woodend’s inaugural Repair Cafe starts this coming Saturday, September 1st. On the first Saturday of the month, (Farmers’ Market Day) from 10am to 1pm, the Cafe will operate out of the Undercroft at the Woodend Neighbourhood House. Next Cafe is Sunday September 30th, 10am to 1pm at the Ray Bradfield Room. There’ll be 2 workshops as well as the usual Cafe activities – sewing machine maintenance and ceramic tiling. Bring along your machine so Ginny can teach you how to maintain it. Want to do some tiling and don’t know how? Paul will show you and explain about glues, grout etc. He’s been doing it for years. Really Really Free Market is planned for Sunday 30th September, in Victory Park alongside the Repair Cafe, most likely from midday til 2.00pm. Daria Healey-Aarons has 16 acres of land in Chewton suitable for sharing. The tour will show people over this land and you will hear about Daria’s history of creating alternative dwellings, including homes from school portables, and a tiny house from a stripped cabin. Best to park in Fryers Road near the Browns Ave turnoff. Wear walking shoes and clothes, and bring a water bottle. 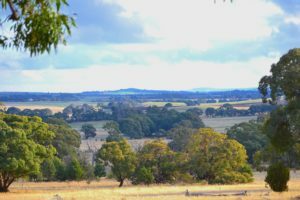 For the past four years the Ararat based community group KORS (Keep the Original Route Supporters) has pleaded for Vic Roads to re-route the western highway expansion. The campaign is founded on 5 key points: indigenous heritage; environmental damage; minimising contribution to climate change; reducing cost; and moderating future impact. The community argues for the road to be widened parallel to the current highway, preserving the roadside remnants and using a power line easement as the lowest impact route. Re-routing the western highway extension will avoid damage to a significant Aboriginal place with artifacts, with proximity to rock art, and with known dreaming. Fewer large old trees and rare habitat will be lost and natural corridors broken. There will be less critically endangered Environment Protection Biodiversity Conservation Act listed Box-Gum Grassy Woodland lost, as well as less Golden Sun Moth habitat lost. There will be fewer emissions from less earthworks on a shorter, flatter route – around 600,000 cubic metres of cut earthworks will be avoided. The cost will be reduced by approx $25million with less invested in climate damaging, resource-heavy activities. And there will be less splintering and fragmentation of the land compared with a large new road that brings traffic into a new place. Vic Roads paused the project in mid 2015 when the tree count error became obvious. The original environmental data was inaccurate and new information has been ignored. 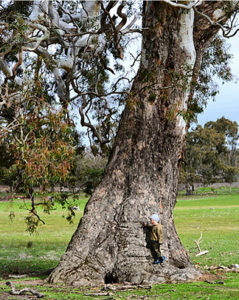 There is evidence that Victoria’s second largest Yellow Gum, which is on the planned route, has been poisoned . It is KORS’ experience that VicRoads provides for the driving public who increasingly seek effortless, safe, high-speed, individual transport. In doing so, VicRoads favours current energy-blind and environment-blind habits and investments, current priorities in project management, as well as current construction job-types and road-making habits, as opposed to a more circumspect road planning process that puts higher priority on minimal impact and which requires careful machinery use in construction. The un-priced costs of current practices are dismissed as being impractical to consider in project planning and a narrow definition of “safety” in road design is marketed as trumping all other concerns. KORS believes there is scope to build this road with much less damage even within Vic Roads narrow, short-term definitions of safety. However this scope is well hidden in technical language and expertise that is hard for lay people to penetrate. KORS has growing community support with a few thousand facebook followers, 5000 petitioners, and a 250 strong email list. Some wins thus far are registration of two significant trees with the National Trust, the progression of a court case and at least five professional reports. For further info and ways to support: go to www.fixfreewayfiasco.org.au or contact KORS via: fixfreewayfiasco@gmail.com You can also send emails to Environment Minister Lily D’Ambrosio, Roads Minister Luke Donnellan, and VicRoads CEO Michael Malouf. Monique Miller will be teaching some of her favourite ferments. 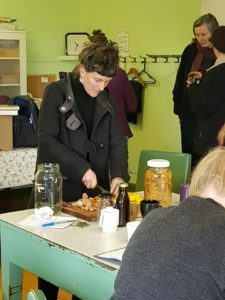 Monique is a generalist and divides her time between running Joe’s Market Garden in Coburg, facilitating edible weed, fermentation workshops and the permaculture design course at CERES in Brunswick East. She has been teaching fermentation for more than 4 years. Since the forum in March this year: How can we do democracy better? a group of locals continue to explore ways to improve our democracy and initiate a process of visioning with and for our community and bio-region. 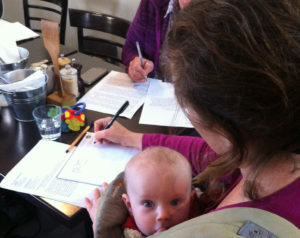 We have been liaising with Voices for Indi, and plan a series of around the kitchen table community conversations. Democracy for Dinner is a space for Central Victorians to contribute to public discourse on important policy issues, as well as ideas for reshaping our democracy locally and nationally. We are looking for volunteers who would like to lead the following conversations. Topic 2: Majoritarianism vs. the Expert – what models of governance do we want for the future? Contact Lexi via info@democracy4dinner.org or 0458 922 220 to nominate yourself or someone else to speak on either of the above. You may also nominate your own topic. Local facilitator, Laurel Freeland is bringing Akasadaka Robison to Australia to run a 5 day facilitator training intensive in Central Victoria. Akasadaka is a senior program leader and trainer for Zenergy Global who has a focus on Regenerative projects. The programme is for regional and regenerative practitioners whose job role includes facilitation. Zenergy Global is a network of facilitators with the vision of ‘Whole People Co-operating in a Sustainable World’. The group have has been running whole person facilitation training for 25 years. Laurel wants to strengthen the cohort of community, business and government facilitators who can help any group achieve their purpose – for the love of Humanity and the Earth. 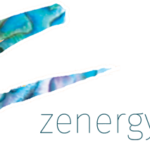 If you want to know more about the course or the services the Zenergy team offers, visit www.Zeneryglobal.com.au or email laurel@zenergyglobal.com.au for an information flyer. 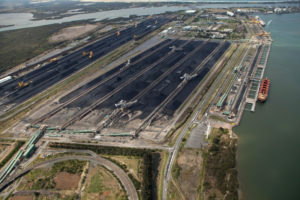 Frontline Action on Coal (Flac) is organising a four day training and blockade of the world’s biggest coal port, at Newcastle NSW, during September 12th to 16th. Central Vic Climate Action (CVCA) wants to send a strong message to the coal industry from Central Victoria. A number of friends and supporters will travel to Newcastle take part in this action. Cost estimate is around $400-500 pp to get up there and take part. CVCA wants to support those going with some financial assistance to make sure $$ is not an impediment to participation so if you are strapped for cash and want to go let us know. How can we re-cultivate the social connections, ecological understandings, and the economic and community values to relocalise our food, and foster greater accountability to the more-than-human life that makes our lives possible? Join us for an evening of discussion with permaculture co-originator David Holmgren (author of RetroSuburbia) and US food movement scholar-activist Eric Holt-Gimenez (author of A Foodies Guide to Capitalism) as they offer insights into how to develop a deep engagement and long-term commitment to regenerative and just economies.